Positive Results from Draft Picks in NCAA - College Hockey, Inc.
Players in 2006-13 drafts who spent their draft year in college have outperformed others. Scott Perunovich led all draft-eligible players in the NCAA last season with 36 points. When Quinn Hughes and Brady Tkachuk enrolled at Michigan and Boston University as 17-year-olds, the two youngest players in college hockey last year, they knew they would be challenging themselves against older players. History also suggests that they may have improved their chances of making an impact at the NHL level. A small subset of the likely selections in the 2018 NHL Draft this Friday and Saturday will have spent the past year playing NCAA hockey. A study of the eight drafts from 2006-13 shows that those players – likely around 10 – could be the best values in the draft. 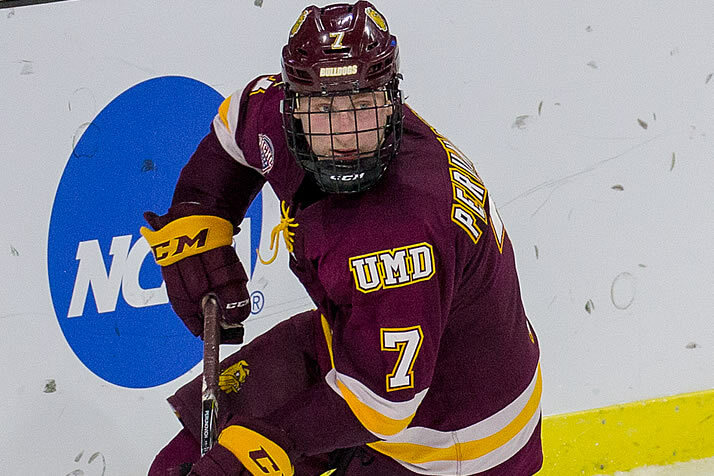 Those eight drafts featured 73 players who played college hockey in their draft season. Of those, a remarkable 70% have reached the NHL for at least one game and 32% have appeared in more than 100 NHL games. Those figures are 22 and 8 percentage points higher, respectively, than all other players in the draft. Players drafted out of the NCAA have not just reached the NHL, but made a significant impact. Players in this study include Stanley Cup champions like Phil Kessel and Alec Martinez, plus rising stars like Shayne Gostisbehere and Joakim Ryan. Most NHL draftees are 18 years old. Since the average age of an NCAA freshman is older than 19, there are relatively few draft-eligible players in the NCAA each year. Those who are playing college, however, get to compete against older players – often as old as 24 or 25. That gives scouts a chance to evaluate prospects against players who are closer, physically, to what those prospects would face in the NHL. In the 2015 NHL Draft, three current college players were taken in the first eight selections (Jack Eichel, Noah Hanifin, Zach Werenski). TSN Director of Scouting Craig Button said at the time that it helped scouts to see those players compete at the college level. Success in the NHL Draft is vastly less predictable beyond the first round. While 94% of all first-rounders will reach the NHL, less than half that number (42%) make it when taken after round one (again, based on 2006-13 drafts). While 42% of picks in rounds two through seven reach the NHL, that number jumps to 68% for those who played college in their draft year. While players like Hughes and Tkachuk get a lot of attention, most current NCAA players in the draft are taken after the first round. That may be there the biggest values lie. Gostisbehere, Martinez, Thatcher Demko and Paul Stastny were all selected out of the college ranks after the first round. Candidates to follow in their footsteps this year include Scott Perunovich (Minnesota Duluth), Logan Hutsko (Boston College) and Patrick Khodorenko (Michigan State). Note: This study was initially published in 2016 and has been updated to reflect the progress of the draft picks in the study.